Fan Worms are marine segmented worms that attach to rocks or sand by their base. You can often see them growing on jetty pylons, boats or pontoons. They are suspension feeders filtering food out of the water column using their specialised tentacles. They are able to retract their tentacles into their tube when they fear a fish might be about to nibble their tentacles. As well as collectiing food their fans are used for breathing and sorting sediment particles to use in their tubes. Their tubes are made of calcium carbonate ans sediment particles, the tube lengthens as the worm grows. 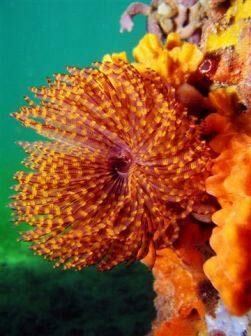 There are many species of fan worms found in most of the world's oceans from intertidal to deep depths. They are related to sabellid worms, beach worms & bristle worms. The larger species can grow up to around 3 cm across the crown.